Chrome CCFL Headlights 09-18 DODGE RAM w/o Factory Projectors Recon Chrome CCFL Halo Headlights w/o Factory Projectors 09-18 DODGE RAM, Chrome CCFL Halo Headlights w/o Factory Projectors 09-18 DODGE RAM, Chrome Headlights w/o Factory Projectors 09-18 DODGE RAM, Chrome CCFL Halo Headlights 09-18 DODGE RAM, [Recon 264270CLCC Head Lights] - $649.95 : 3rd Strike Performance, Your Source for Late Model MOPAR Performance Parts and Accessories! Make the front end of your Dodge Ram stand out from all of the others with a custom set of Projector Headlights from Recon. These headlights exceed OEM requirement for on road use and are 100% DOT approved. The Recon Projector Headlights feature halo low beam lights and daytime running lights in either LED or CCFL styles. The headlights are designed to be a direct bolt on to make installation fast and simple. These lights can be installed in your driveway without the use of specialty tools. Comes with detailed instructions and everything need to install your new custom headlights from Recon. Light up the road while turning heads with this one simple bolt on custom set of Projector Headlights for your Ram truck. CCFL lighting is the oldest halo lighting technology. It produces a smooth glow that a lot of customers really like. Unlike LED lights you can't see a bunch of individual lights on the ring. The notable disadvantage to CCFL is that it is not as bright as LED. 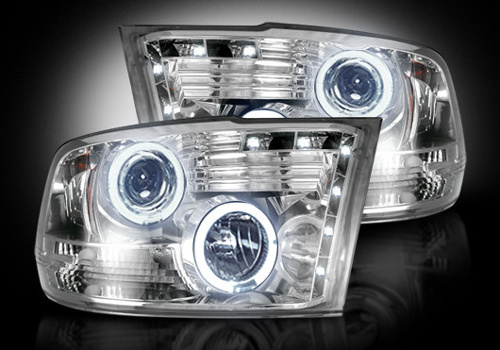 Take your Dodge Ram to the next level with a great looking custom set of Projector Headlights from Recon. Upgrade your night vision all while turning heads everywhere your go with these lights. Turn night into day with Recon lights. For trucks without Factory Projector Headlights only!